Signs of a Cold or Alzheimer’s? Kate’s cold and accompanying cough continued yesterday. I believe it was somewhat, but not dramatically, improved. It’s been an interesting cold in that her symptoms have been pretty even over the course of the past week. She hasn’t had a fever, and she goes long periods (an hour or two or more) without coughing. She doesn’t go quite as long without blowing her nose, but that also comes and goes. Her overall behavior, however, suggests she has not been herself. She has been more confused and dependent. She has had greater difficulty working her jigsaw puzzles. She has actually had moments when she didn’t know what she should do with pieces once they were scattered across the screen of her iPad. I don’t mean she didn’t know the exact place to put them; she didn’t know what to do at all. She has also had several hallucinatory experiences. Two of those were a week ago, and one occurred last night. We stopped at a traffic light on our way home from dinner, and she said, “Is there anything I can do to help you?” This came out of the blue for me. I didn’t know what she might have been thinking and said, “What made you ask that?” She said, “You’ve been going through so much.” I was still confused but decided not to question her. I simply assured her that I was getting along well. I told her that she had always been my support, that she should just continue that. She appeared relieved. As usual, she worked on her iPad after we got home from dinner. She couldn’t remember how to start, that is, to open the puzzle app. This was not the first time. I showed her as I have done before. Once it was open, I showed her the various options she could choose. I walked away, and she immediately ran into a problem. She hit an arrow at the top left of the screen that took her to the store instead of selecting one of the puzzle options that filled the rest of the screen. That, too, was not the first time, but it is becoming more frequent. When she went back to the puzzles, she worked them for about an hour. Our son called as she was getting started. She said hello with her usual enthusiasm, but then quickly returned to her puzzles. While I was on the phone, she asked me for help several times. Her attention was clearly on the puzzles and not the phone call from Kevin. When I got off the phone, she wanted to get ready for bed. First, she walked over to me and expressed her concern about me. She made reference to “that man.” I asked if she meant Kevin. She didn’t, but she was unable to tell me who “that man” is. I did grasp that she was again worried about me and the load I am carrying. One might think she was talking about my role as a caregiver, but it was not. I got the distinct impression that it had something to do with my work or volunteer activities. Interestingly, they are minimal these days; however, I am sure hallucinatory experiences often relate to distant memories. She was tired and went to bed a little earlier than usual. She had done the same the night before. I think this could be related to her cold. After thirty minutes or so, she appeared to be asleep. I joined her thirty minutes later. When I did, I discovered that she was awake and whimpering. I asked her what was wrong. She didn’t (couldn’t?) explain but said, “The babies.” I told her I didn’t understand but wanted to help her. She went on to say, “I do want a baby, maybe two.” I mentioned our having had two babies who were now grown up. She was startled, not about having babies, but that she and I had babies. I told her I was her husband. She strongly denied it. I knew I needed to go in a different direction. This was another time I felt explanations were irrelevant; she needed comfort. I told her just that and said, “I love you dearly, and I want to comfort you.” She said, “I know you do. I can tell by your voice that you’re not just saying that.” That began what may have been close to an hour of conversation during which she talked, and I gave supportive responses. I never fully understood what it was that prompted her worry. At one point, I asked her if she were afraid. She said she was. I was never able to discover why. What I do know is that she thought she was young and unmarried. A couple of times she said, “I can have a child. I have one now.” One of those times she put both hands on her stomach as she said this. That may have meant she was carrying a child now. She also responded to me as if she knew I were her husband. I told her I loved her, and she said she loved me. Despite this, I don’t believe she ever recognized that I am her husband. I was just someone she felt very close to. She was very comfortable talking with me. Finally, she relaxed, and we both fell asleep. It was a week ago yesterday afternoon that I noticed the first sign that she was getting sick. She coughed a few times, and it didn’t sound like a normal clearing of her throat. The next morning it was obvious she had a cold. It was that afternoon that she had an hallucination that involved our working in some kind of education project in another country. At the time I wondered if that could have been a side effect of the Robitussin DM or Zyrtec, the cold itself, or her Alzheimer’s. One thing is clear. She has been noticeably different this week. I have eliminated the Robitussin and Zyrtec. I am left with the possibility of the cold itself or Alzheimer’s. At the moment, I believe Alzheimer’s is the primary cause and that the cold may have aggravated the situation. Time will tell. Kate’s imagination was active over the weekend. Before we got out of the car for lunch yesterday, she had a look on her face that signaled deep concern. She said, “I just don’t know what to think.” As often happens, she couldn’t explain what had happened. She said something about our daughter, Jesse. I asked if she thought something had happened with Jesse and her husband, Greg. She nodded. I said, “Did you think they were separated?” Again, she nodded. I told her everything was all right, that they had not separated. She said, “I must have imagined it.” Periodically, she has had experiences like this, and she seems to grasp that the origin is in her mind. As we were leaving the house for dinner last night, she specifically went to our bedroom and turned on the lamp on the table next to here side of the bed. She asked if she should turn on the one on my side. I told her I thought we could leave it off. As we walked through the family room, she asked, “What time are they coming?” I told her we weren’t expecting anyone, that we would have the house to ourselves. She didn’t say anything else, and I didn’t ask. While at Panera this morning, I received a phone call from Scott Greeley. We arranged for the Greeleys to visit us this Saturday. When we hung up, I told Kate it was Scott and that they would be in Knoxville on Saturday for lunch. She said, “Good. I really like them.” Then she added, “What’s her name?” I told her. Only moments later, she said, “Jan.” I said, “Right.” Then she said, “I know that you know her name; I just wanted to let you know I got it myself without asking you.” She had apparently forgotten that just moments before she had asked me for Jan’s name. When I got home from Rotary, the Y, and the grocery this afternoon, Kate was ready to get out of the house. As she has done a number of other times recently, she was carrying a night gown, a robe, a pair of pants, and a top. She noticed that I was taking 6 new pairs of socks out of their packages and asked that I give them to her. She did not have her iPad and a cup. I got a cup and then used the Find my iPhone app to locate her iPad. When I returned to the kitchen with the iPad, she was still holding the clothes along with the socks I had just bought. I asked if she were planning to take the clothes with her. She indicated she was. I told her I didn’t think she would need them. She said that would be fine. I suggested we leave them on the love seat in the family room until we returned. She put them on the love seat. As we started for the car, she picked up the robe and brought it with her. It’s sitting in the car right now. Over the past few years I have grown accustomed to Kate’s saying something to me as though she is responding to something I have just said. It puzzled me when it happened the first time. Out of the blue she said, “I can’t believe they would say that about my mother.” I responded with, “Who are you talking about?” She told me and then said, “You’re the one who told me what they said.” She has repeated variations of this as many as five or six times although I haven’t heard her say anything in quite a while. The issue has always involved someone’s saying something about her mother. Today at Panera, I had just put a sandwich on the table in front of her. When I sat down, I noticed that she had a strange look on her face. She seemed puzzled. She could tell I was puzzled and said, “I think of both of them as mothers.” Although I quickly understood that she thought I had told her something, I couldn’t imagine what. I asked what she meant. She said, “I’m shocked.” I explained that I was confused. She said she was as well. Then she said, “Stop. Just tell me slowly what happened.” I explained from my point of view and asked who she was talking about when she mentioned thinking of “both of them as mothers.” She told me she was talking about her mother and the youth director at her church when she was a teenager. The big surprise was that she thought I had told her that the youth director was her real mother. I explained that I hadn’t said that. As I did, I was prepared for her to dispute me because that is what she has done in the other situations. I was quite relieved when she believed me. She continued to talk about the emotion she felt before I straightened things out. As we walked to the car to go back to the house, she brought it up again. When she got in the car, she said, “Well, we’ll look back on this and laugh, but it wasn’t funny at the time.” She brought it up again when we got home. This must have been a full thirty minutes after this episode occurred. The fact that she remembered for that long is a sign of the intensity of this experience. At lunch today, Kate asked me something about “a guy who wanted to make her naked.” I had no idea what she was talking about and said so. She looked frustrated with me and indicated I must have remembered. She went on to say that she had been in the restroom, and there was a man and a woman. The man wanted to disrobe her and walk her around the restaurant and parade her outside. She said she knew that I would not let that happen. I assured her that was the case. A moment later, she asked me the name of our server. I told her it was Sandra. Then I said that reminded me of someone who was in her bridge club years ago. I could see that she didn’t recall and went on to tell her the names of each of the members and their spouses. She said, “Where was this?” I told her it was right here in Knoxville. I noted that two other members of the club as well as the two of us are the only remaining living members. She said, “Where was this? In North Carolina?” It was clear that she had little or no memory of the bridge club of which she had been a member for more than twenty years. Then she asked me our daughter, Jesse’s, middle name. I told her. She asked what her last name is. She followed that by asking her husband’s name. After I mentioned the twins, she asked their names. I said something about having a son in Texas, and she asked his name. These are not names that are lost forever. They come and go in her memory, but they are signs that the names will be forgotten sometime in the future. When I encounter moments like these, I am amazed that she functions as well as she does. Kate and I went to dinner and a movie tonight. The latter is a rarity for us now. I have not been scheduling anything at night beyond dinner for several months now. This time, however, The Flick, our favorite theater, had a Thai film that started at 7:00. It sounded intriguing, and I thought it was worth a try. During dinner, I was thinking about how well the visit with the sitter had gone. I also felt I should add another journal entry specifically about how good-natured Kate has been today. Right now I want to make it clear that she seemed remarkably agreeable and at ease. It was not only how she received the sitter but also how she responded to my help on getting her clothes to wear out this evening. In the car on the way home, she said in a very angry tone of voice, “And I have never exaggerated.” I told her I hadn’t said that. She said, “You certainly did just a little while ago.” I let it go because I could tell this was one of those instances in which she had had some kind of misperceptions (delusion) that I had done so, and it would do no good to argue. Later at home she expressed the strongest anger I have ever heard from her. Unprompted, she said, “I have never exaggerated about anything.” I told I knew that she never exaggerated. She didn’t say anything for a while. My impression was that she had gotten emotional over her salivation. She was burping and making other noises. In a few minutes, she came out of the bathroom with some toilet tissue that she was holding to her mouth. I told her I wished there were something I could do to help her. She looked at me and spoke in a gentle kind voice, “Oh, I’m fine.” She seems to be back to normal right now. A few minutes ago I left Kate in the bedroom working on her iPad while I went to the kitchen to check on something. As I left, I said, “I’m going to get ready for a shower in a few minutes.” When I came back, she had put the iPad on the ottoman of her chair and was watching the news on TV. She also had an angry look on her face. She said, “You told me to put that thing (the iPad) down and watch the news for a change.” I told her I hadn’t said that. She said, “Yes, you did. Don’t deny it.” I leaned down by chair and put my arm around her shoulder. I decided arguing wouldn’t get us anywhere. I told her I loved her and that she didn’t need to watch the news. She sat quietly fuming for a minute. Then she said, “I just get so tired of being so dependent on you. I can’t go anywhere or do anything without you. Here I am in my 70s and I’m treated like a child.” I repeated that I love her and told her I knew it was hard.” Then I asked if she would like to watch Golden Girls. She said, “I don’t care.” I turned off the news and now Golden Girls is playing. She is working on her iPad again. Although she has talked any number of times about her not liking to be dependent on me, this is the first time she ever blamed me or took it out on me. I realize that she is likely to have forgotten this tomorrow, but I can’t help wondering if this signals a change in her outlook toward me. It comes just after a period of several days during which she has been unusually cheerful and cooperative. What a dramatic change she has made tonight. The drama is now over. She just got up from her chair and said, “Well, Babe.” She didn’t sound angry at all. I asked if she were going to get something to wear to bed. She smiled and said she was. I told her I loved her, and she walked to her room. I hope she returns in the same state of mind in which she left. Wow! This came at me from left field. To underscore how dramatic this was for me, this was the first time I have ever heard her express anger with me from the beginning of our marriage to now. She has expressed irritation frequently over the past few years, but this reaction was well beyond anything I have seen before. I am very glad that it has blown over and, hopefully, won’t return again. When she returned from her room, she was just as pleasant as she has been for the past few days. It is as though the angry outburst never happened. We arrived home again at 8:15 last night. All-in-all the Christmas visit had gone well. Kate seems to have enjoyed herself. I spent about an hour checking email, unpacking and taking a shower before settling in to watch a Cowboys game on TV. I hadn’t seen Kate seen we got back and went to look for her. I found her in bed in the middle guest room working puzzles on her iPad. I asked if she were planning to come to bed. She said, “I thought you wanted me in here.” I may not have mentioned it before, but this is not the first time this has happened. This was the first time in a long time though. On the trip home after a stop for lunch, Kate said, “I know I’ve said this before, but I am really excited about moving to Texas.” I said, “Yes, you have mentioned that before, and I know you are excited even though it will be a long time.” Neither of us said anything more. Jesse told me that she had mentioned moving to Texas in addition to the time she said something on a previous trip to Memphis. I moved behind Kate and shook my head to indicate this wasn’t so. They didn’t dispute or feed this conversation. This morning was our monthly Y breakfast. I didn’t wake up until 7:06. I got up right away and reminded Kate. She initially said she wanted to go and got up to go to the bathroom. She came back into the bedroom and got in the bed. Then she told me to go on ahead without her which I did. Sometime after getting home from the breakfast, I checked to see if she were up. She was. I noticed two pair of her black slacks thrown on my side of the bed. Then I found another pair on the floor beside the toilet in the middle bathroom. When I found her, she was wearing a pair of black slacks. I just hung up the slacks I found. 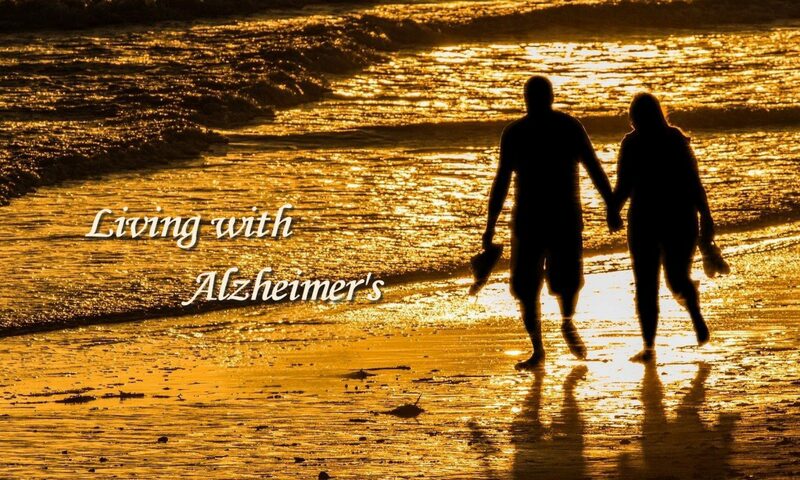 I have heard other people talk about Alzheimer’s patients and sundowning. I have wondered if that is something that Kate is likely to experience. Up until now I had not noticed any signs of what I believe to be sundowning. There have been several times recently when I have wondered. These instances occurred when we had planned to go someplace for the evening. When I mentioned that it was time for us to get ready, she has reacted very negatively. The times I remember involved going to a concert. One was the symphony. The other, I think, was a local choral group. This past Saturday it happened again. We have missed the last two symphony concerts. I was quite interested in the one this past Saturday because of the soloist (a former child prodigy who is now 33) who was playing the Mendelssohn violin concerto. The orchestra was playing the Tchaikovsky 5th Symphony. I thought this would be a concert that Kate might enjoy; so I made reservations to a luncheon with the soloist this past Friday. We went, and she enjoyed being there to meet her. We talked about Saturday’s concert. She was interested. I mentioned it to her several times on Saturday. Then about an hour before we were to leave I told her it was getting time for us to get ready. This made her very unhappy. In fact, she had gotten out of the bed and then got back in and pulled the covers over her. I tried not to force her to go but said, “”But you had told me you wanted to go. You enjoyed meeting the soloist at lunch yesterday.” I went on to tell her that she didn’t have to go, that I didn’t want her to be upset, that I would go on. After a few minutes, she decided to go with me. She ended up enjoying the concert and got to speak with a number of people we know. It was after this that I began to draw an association with sundowning. In the future I will be more careful to pay attention to her behavior around the end of the day. The second thing that happened was yesterday. I had come home from church right after Sunday school as I have been doing for several months now. When we got home after lunch, Kate worked on her iPad. Then she lay down to rest. When she got up, I could tell that she was down. I decided to see if she would like to eat dinner a little early. She said she would. She was silent in the car going to the restaurant, and she wanted me to be quiet. As we were about to get out of the car, she said she was “down.” Then she went on to say, “I just can’t believe they would say that.” (I should also mention that in the past 24-48 hours she has mentioned something that indicated she thought I was checking with some friends in Nashville about something. I presumed this involved this same issue.) I asked her if she were talking about the same couple she has mentioned before. She nodded. She seemed seriously disturbed. When we had ordered, I reminded her of something I had said a week to ten days ago. I said that I really didn’t want her to have to struggle so because I believed she had had a dream about the whole thing and that I was unaware of our friends ever saying anything about her mother, certainly not to me. She appeared to accept it but with a little doubt. This morning while we were at Panera she seemed in a good mood. At one point she volunteered that she had decided I was right, that she had just dreamed the whole thing (again without saying what the “whole thing” was) and that now she couldn’t even remember what they said. She told me she could remember my telling her it was a dream but not what they said. What I am hoping is that she will not call up her memory again so that we have to go through the same process again. She told me she felt better about our friends. Kate and I are both trying to recover from colds we got late last week. She got hers about 2 days later than I, but hers was more severe. Sunday (2 days ago) was very hard for her. She moaned and groaned very audibly. She often does this anyway, but this was much louder and more intense. She was miserable. Fortunately, today has been much better though as I write this post, she is saying, “Oh, Oh, Uh . . .” She sounds as those she is in serious pain. I am hoping tomorrow is closer to a normal one. By that I mean our “new normal.” Given Kate’s decline, our normal is quite different than it was even 3-6 months ago. Today she has experienced several moments of confusion. This morning, for example, as we were getting ready for lunch, she said she was going to get her clothes and take a shower before leaving. In a few minutes, she came back to the bedroom where I was dressing and asked, “Did you say you laid out my clothes for me?” I told her that I hadn’t. This was apparently one of those occasions when she thought I had told her something but hadn’t. I can’t remember them now, but she mentioned 2-3 other things that she thought I had said. This afternoon we went to her dentist to pick up her new night guard. She had lost the other one a while back and has been using a temporary one since a week or so before we left for our cruise in January. While she was with the dentist, I went over to Starbucks for a cup of coffee. I got a call that she was ready. When I walked in the door, I walked over to Kate and planned to leave. Kate told me that the dentist was going to come out and explain something. We waited about 10 minutes. Finally one of the women behind the counter called to us. I told her we were waiting on the dentist. She told me that Kate was all finished and that we were free to go. Shortly after returning home from dinner this evening, Kate called to me. She said, she had left her night guard at the restaurant. She described to me how she had taken it out of her mouth, wrapped it in a napkin, and put it on the table. She just knew that it had been picked up and thrown out as trash. I called the restaurant to see if our server might have found it. She had not. I told them we had just picked it up this afternoon and that it cost almost $600. The person on the phone said they would be happy to look in the trash. Before I could answer, I could hear Kate calling to me that she had found it. It was in its container. I suspect this is only the beginning of many such occurrences. Today she had another experience in which she thought I had told her something. About an hour after we got back from lunch, she called to me from her office and said that she was going to try to take a nap. Another hour or so later, she came into the kitchen and said, “You were right.” I then guessed, “You couldn’t get to sleep?” She nodded her agreement. I didn’t tell her, but I had never said anything about her not being likely to get to sleep. She clearly thought we had. I have observed this kind of misunderstanding several other times. Will be looking to see if this is something that gets worse.